Hilton El Conquistador Golf & Tennis Resort - Tucson, Ariz. 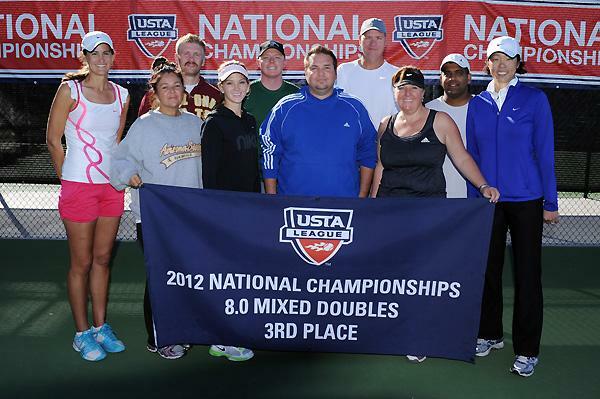 The 2012 USTA Tennis season concluded for adults last weekend, and Southwest finished near the top with another strong finish at the USTA Mixed League National Championships at the Hilton El Conquistador Golf & Tennis Resort in Tucson, Ariz.
A Phoenix area team representing USTA Central Arizona picked up third place at the 8.0 Mixed League Championships. The team, which plays out of the Phoenix Tennis Center, went 22-4 on the season, going 13-3 during the local level regular season, swept five matches at the USTA Southwest Mixed League Championships and went 4-1 at the USTA Mixed League National Championships. The Phoenix team breezed through its flight at Nationals, winning all three matches to reach the semis, before being upended 2-1 by a team from Cherry Hill, New Jersey (Middle States). The Phoenix team then rebounded for a 3-0 victory over USTA Southern (Memphis, Tenn.) in the third place match. Coupled with a national championship in the Men's 4.5 level (Central Arizona), another third place in 3.5 Senior Men's (Central Arizona), and a fourth place in 6.0 Mixed (Greater El Paso), this was another successful national league championship season for USTA Southwest. Congrats to all of our teams that made national trips this season. FRONT ROW: Julie Stelse, Karen Peck, Stephanie Haldeman (Peoria, Ariz.), Aaron Gomez (captain), Amy Rhoden, J. Richardson. BACK ROW: Christopher Whitten, Edward Maddux, Roy Hester, Naveen Mathew.